Director of Moscow’s Institute for U.S. and Canadian Studies describes how Washington’s establishment of two giant economic coalitions is pushing Russia into a new foreign policy strategy. Since the days of Harry Truman, every American president has announced his foreign policy doctrine in a major speech before Congress. In his State of the Union address in February 2013, President Barack Obama set out his priorities. Globally, Obama intends to put the United States at the head of two giant economic blocks – the Trans-Atlantic and Trans-Pacific Partnerships. The purpose is to cement Washington’s leadership in a polycentric system of international relations. Simultaneously, Obama – who is trying to put an end to a decade of wars conducted by his predecessor George W. Bush – faces the task of making an orderly retreat from the international arena without making it look like a panicked flight. This policy has become a key component of the Obama doctrine, which is based on “smart power” and emphasizes non-military means for securing U.S. influence in a multi-polar world. The U.S. share of global GDP has shrunk from 23 percent a decade ago to 18 percent today, while the share of main land China has increased from 10 percent to 15 percent during the same period. Unless the Chinese development model hits an impasse, China will likely catch up with the U.S. in terms of GDP this decade, and will become twice as big on an exchange-rate basis by the middle of the century. National Security Advisor Tom Donilon has said on several occasions that the White House believes a Trans-Pacific Partnership (TPP) could help the U.S. to remedy the situation. It’s on this basis that Washington is planning to set up a free trade zone in the Asia-Pacific region. If the TTP becomes a reality, the US will account for three-fourths of the partnership’s combined GDP. This will ensure American dominance within the new economic alliance. At the same time, the TTP is an alternative to the ASEAN+3 arrangement promoted by Beijing (a regional economic coalition of China, Japan, and South Korea plus the ASEAN members). After the accession of India, Australia, and New Zealand, the group has been expanded to ASEAN+6. China, accounting for half of the combined $17 billion GDP of the alliance’s 16 members (with a combined population of more than three billion), would likely play a dominating role in the organisation. I believe it was this situation that led Obama to declare the TTP a top priority. Washington cannot allow Asia to integrate economically under Beijing’s tutelage. Washington and Beijing’s projects in the region are therefore incompatible. An acute geopolitical rivalry between the U.S. and China is thus emerging in the Asia-Pacific region, and it’s likely to continue decades into the future. The new U.S. strategy, however, is not limited to the Asia-Pacific region. The establishment of the Trans-Atlantic Partnership together with the TTP is also a top priority for Obama’s second term. As the process of globalization has slowed in recent years because of an inability to overcome disagreements between developed and developing countries, Obama’s administration has focused on establishing interrelated regional economic blocks that comprise most developed democracies in North America, Europe and the Asia-Pacific region. The White House hopes to establish the TAP and the TTP before the end of Obama’s second term. Obama is thus planning to place the United States at the helm of two “rings,” two giant regional economic coalitions, the Trans-Atlantic and Trans-Pacific Partnerships, which account today for 20 percent of the world’s population, 65 percent of global GDP, and almost 70 percent of global exports. China’s prospects look rather modest compared to this: 19 percent of the population, 15.8 percent of GDP and 10 percent of exports. Even taking into account China’s continued high growth rates in the coming years, Beijing would still trail far behind the two U.S.-led regional coalitions. The coalitions would therefore secure a solid leadership position for Washington in the polycentric system of international relations of the future. Washington has consistently expressed concern over China’s military modernization program. An annual Worldwide Threat Assessment of the U.S. Intelligence Community released on March 12 said that China had a “limited, albeit growing, capacity for power projection” not only in the Pacific, but also in the Indian Ocean. If this happens, the combined defence budget of the TAP (i.e. 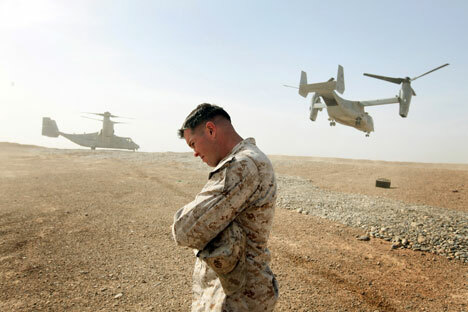 of the U.S. and European NATO members) would account for around 60 percent of global military spending. Taking into account U.S. allies in the Asia-Pacific region, this would exceed 65 percent. Moreover, the share of both U.S.-led coalitions of weapons production spending will amount to at least 80 percent, and of defence-related R&D to more than 90 percent. Neither China nor the BRICS countries can compare to the TAP and the TTP on those measures. This long-term U.S. strategy may fail unless the Obama administration manages to overcome the existing disagreements with its allies and partners. The differences between the economic interests of Washington and its allies can be bridged, but doing so will require mutual concessions, something neither the U.S. nor the other TTP and TAP participants seem to be prepared for at the moment. Washington hasn’t invited Moscow to take part in either of these giant coalitions. China isn’t exactly welcoming Moscow to the ASEAN+6 economic partnership, either. This makes one think about Russia’s place in the new configuration of international relations. Russia’s “critical mass” is relatively small – approximately 2 percent of the global population and 3 percent of the GDP. While this share would grow in the event of successful Eurasian integration, it would still lag far behind the global giants. Geopolitical and geo-economic isolation within a new system of international relations is fraught with big risks. Although just like the United States, Russia has access to both the Atlantic and the Pacific Oceans, Moscow takes little part in the integration processes in the West or the East. I believe it is necessary to look for a way out of this situation. Thanks to its geographical position, Russia should become a continental link between the Pacific and Euro-Atlantic integration efforts. Sergey Rogov is Director of the Institute for U.S. and Canadian Studies and a member of the Russian Academy of Sciences.